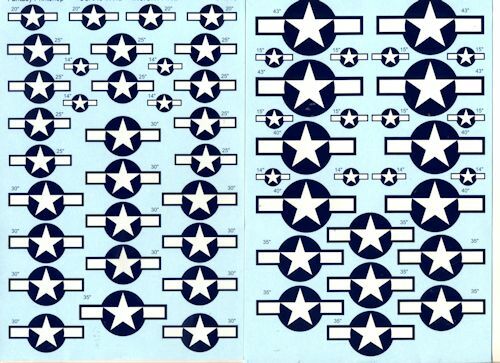 These are WWII US insignia in 1/32 scale. The time period for these markings is from September 1943 until January 1947 when the red bar was added. These sheets are quite useful if the kit decals are poorly done or the wrong size. There are at least four insignia in each size and more in some of the smaller ones. These are 43", 40", 35", 30", 25", 20", 15" and 14". Due to the size of the markings, Fantasy Printshop offers two full sheets.